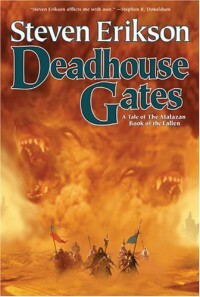 Like Gardens of the Moon, Deadhouse Gates is the type of book that you have to invest a lot of time into. At around 300+ pages longer than the average fantasy book, I struggled with the length and at around 600 pages I started to wonder if Erikson even has an editor. I also struggled with connecting with any of the characters and was disappointed that most of the characters from the first book were not around. Despite my disappointment, it was only after I finished reading a book not by Steven Erikson that I realised how much I missed the ridiculously detailed style of writing, the infinitude of characters and perpetually feeling confused. I'll definitely move onto Memories of Ice, but at over 1000 pages I think I'll wait a little longer so I can truly savour the writing.